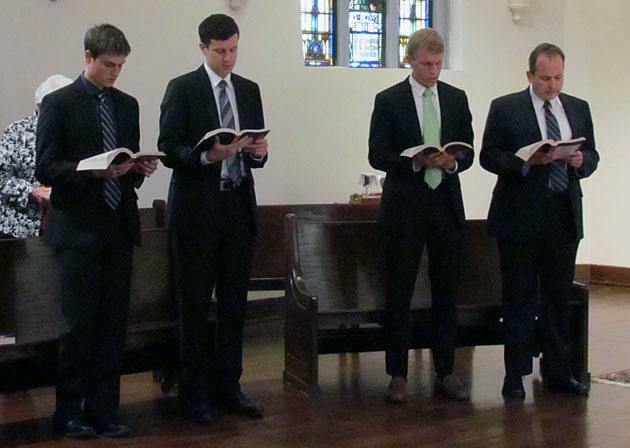 Four men were welcomed in to the Paulist novitiate Aug. 24 during a Mass at St. Paul’s College in Washington, D.C. 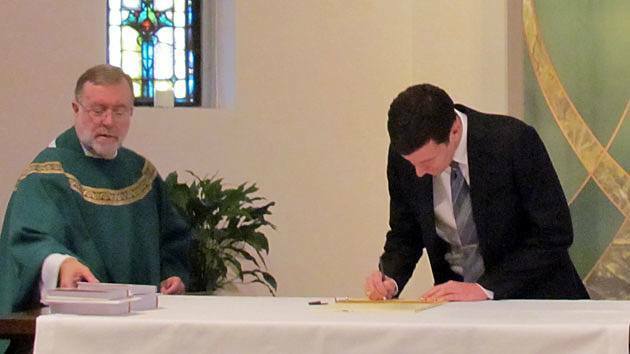 The Paulist novice class of 2013 includes Daniel Arthur, Michael Cruickshank, Evan Cummings and Paolo Puccini. The foursome will spend the next year learning about and living in the Paulist community and discerning their callings to the priesthood. 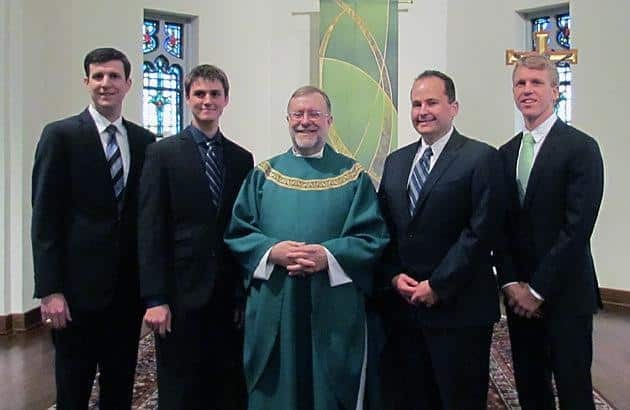 The members of the 2013 novice class will make their first professions in the community next fall when they commit themselves to live according to the Paulist constitution for the following 12 months and begin academic studies for the priesthood. Evan Cummings (left) , Paulo Puccini, Michael Cruickshank and Daniel Arthur sing the entrance hymn during the Mass where they will officially sign in as Paulist novices Aug. 24 at St. Paul’s College in Washington, D.C.
From there, he said, the novices will begin to engage the Paulist charism by becoming men who will preach the Good News, seek unity among Christians, work toward understanding between religions and become reconcilers. The novices will also be exposed to Paulist history and tradition, and introduced to the writings and experience of Paulist Founder and Servant of God Father Isaac T. Hecker and his companions, according to Father Colgan. 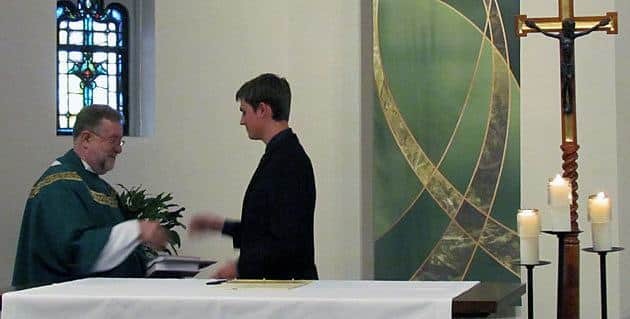 All of this will prepare the novices for their Lenten apostolate, where the four men will experience the Paulist charism through hands-on ministry in one of the 23 Paulist faith communities and centers in North America. 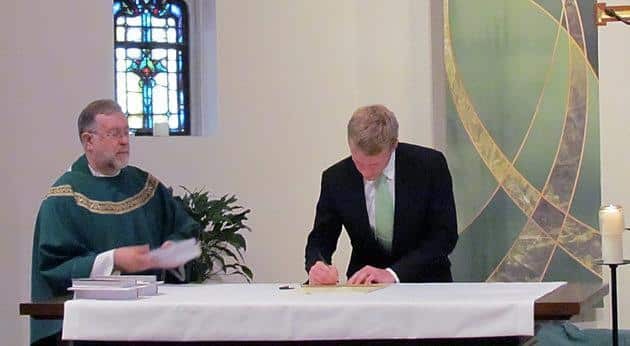 Like Paulist Founder and Servant of God Father Isaac Hecker was in the 19th century, Mr. Arthur is a convert to Catholicism, having joined the Church in 2002. “Seeing what [Hecker] did to find his place in the Church and in American culture really resonated with me,” Mr. Arthur said. Education: Computer science degree from Washington University, St. Louis, Mo. Even though he didn’t realize the connection, Mr. Cummings grew up in a parish founded by the Paulists, St. Rose of Lima in Layton, Utah. 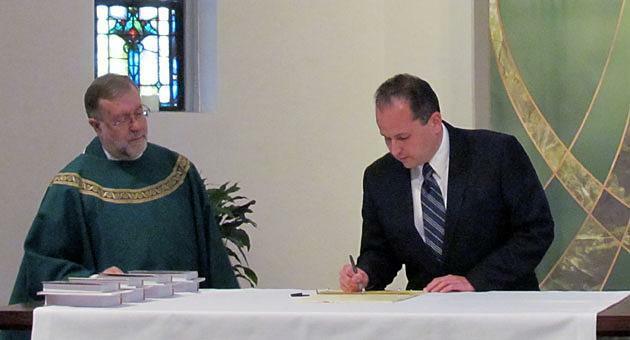 “I like all of the different Paulist ministries, and can see myself doing any of them,” said Mr. Cummings. “I was really attracted to the Paulist mission of evangelization,” said Mr. Puccini. “There seems to be such a definite hunger for God’s Word in the world.